“These kids are so successful–so young”, remarked Tom Proost (Prairie ’77), a veteran of the film industry in California. 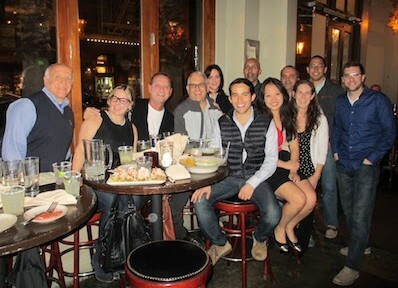 A group of Prairie School alumni with grad years ranging from 1977 to 2010, including Proost, gathered recently in San Francisco for an Alumni event organized by Prairie’s Alumni Office. They went on to describe a work environment with ping pong tables, people riding bicycles, casual dress, and a daily interaction with the top corporate individuals. “The electric cars get front parking spots,” laughed Keith Lehman. On the other side of the room, guests closely listened to Dr. Gurpreet Dhaliwal (’91) tell of his recent feature in the New York Times. Dr. Dhaliwal, an Assistant Professor at University of California/San Francisco (UCSF), shared that being recognized for his work with computer medical diagnosis was an honor but he most enjoyed and valued his parents’ pride and joy as well as Prairie’s recognition in previous school communication. Also that night, Armen Vidian (Prairie ’88), MIT & Stanford grad, reconnected with Jean Xin ’10, a senior at MIT who currently holds an internship in San Francisco. They had first met at a Prairie alum gathering in Boston. Vidian, an entrepreneur who has worked extensively in France as well as throughout the U.S., described the different perspectives of San Francisco area business builders. Chris Martinez ’02, (and Stanford graduate), father to a new baby boy, said he would love for his boy to also attend Stanford. Martinez described for the group his new business Glow, which is developing apps to help women get pregnant. Similar to other Prairie Alumni Events, guests exchanged contact information–often with the idea of reconnecting to further pursue business ideas.